We take a look back at some of the key numbers from The Masters after Tiger Woods' historic one-shot victory at Augusta. Dustin Johnson is the new world No 1 after climbing above Justin Rose following his tie for second at Augusta. The number of operations Woods has had on his back in the period between his 14th and 15th major victories. The number of Masters titles for Woods, one shy of Jack Nicklaus' record. Woods' new world ranking after his victory at Augusta, his highest since 2014. Woods becomes the seventh player to win the Masters in his 40s, following Jack Nicklaus, Ben Crenshaw, Gary Player, Sam Snead, Mark O'Meara and Ben Hogan. The number of years between Woods' fourth and fifth titles at Augusta. The win was Woods' 15th major championship victory, still three behind Nicklaus' record of 18. Tiger Woods made 22 birdies over the four days on his way to finishing 13 under for the week. 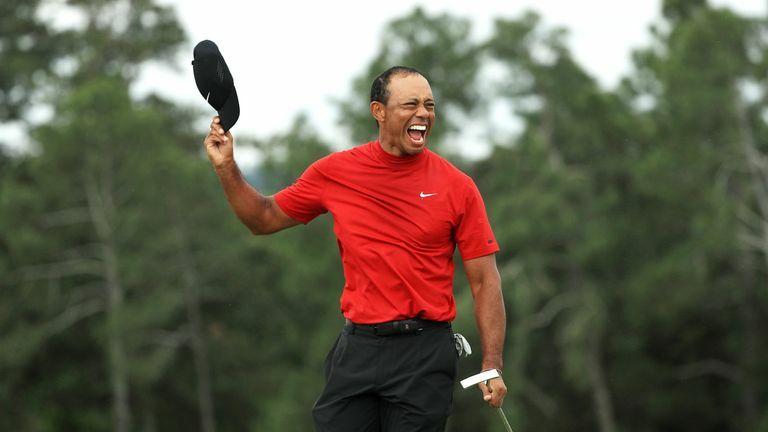 It is also 22 years since Woods won his first Masters title in 1997 as a 21-year-old, when he became the youngest-ever winner of the tournament. The number of birdies over the week by Xander Schauffele - the most of any player. The American birdied 13 of the 16 par fives he played. Woods is a combined 32 under par for his last three major championships. He was a combined 37 over for the five before that. The number of different players who won a major title between Woods' victory on Sunday and his last Masters triumph in 2005. At the age of 43, Woods is the second oldest Masters champion, behind only Nicklaus, who won in 1986 as a 46-year-old. Number of fairways hit (out of 56) by Japanese amateur Takumi Kanaya, the most of any player in the field. Woods hit 35 fairways over the four days. This is the first time Woods has won a major championship when he wasn't leading after 54 holes. The final-round score of third-round leader Francesco Molinari, who finished in a tie for fifth on 11 under. Woods hit 81 per cent of greens in regulation, more than any other player. Seven of his 14 missed greens came on Thursday. It was also Woods' 81st career win on the PGA Tour, leaving him one short of Sam Snead's record. The average distance in yards of Tony Finau's drives over the four days - the longest of any player in the field. This was the first time Woods has played in the final group of a major since the 2009 PGA Championship. The number of days between Woods' win at Augusta and his previous major championship success at the 2008 US Open - the fifth longest span between major titles. The amount, in dollars, that one lucky punter won after laying down $85,000 at 14/1 odds. Woods' prize money, in dollars, for his 2019 Masters win. Woods' all-time career earnings at Augusta now tops the $9m mark, passing Phil Mickelson as the all-time money winner at Augusta.